The Penzion Kríž Cesky Krumlov is located only five minutes away from the historical city center. 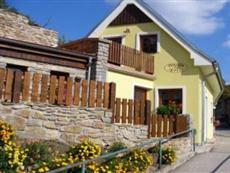 This is one of the closest Cesky Krumlov hotels to many attractions. Nearby, guests will find the Krumlov Castle as well as the Wax Museum. The guests of the Penzion Kríž Cesky Krumlov will find that the Prague airport is 180 kilometers away. Local buses and shuttles offer transit to the airport in approximately three hours, and trains offer transit in five. Taxis are available, but most attractions are easiest to reach on foot. All of the guestrooms at the Penzion Kríž Cesky Krumlov are comfortably equipped and well furnished. All rooms offer satellite television as well as an en-suite bathroom. The hotel is accessible for disabled guests and offers a specially adapted room. Guests of the Penzion Kríž Cesky Krumlov will find that the village offers many restaurants and shops. The hotel offers a complimentary breakfast onsite. There is also a free parking area onsite for guests with rental cars.